Blondie and Brownie: Sullivan Street Treats at 'wichcraft! We asked them to warm the bomboloni and brioche slightly and about 5 seconds later our little bomboloni was warmed and oozing out it's filling. Hmm. I guess this wasn't the vanilla pastry cream filled kind. No matter. We do not discriminate against bomboloni on a basis of size or filling. And our openness to new bomboloni experiences was rewarded. 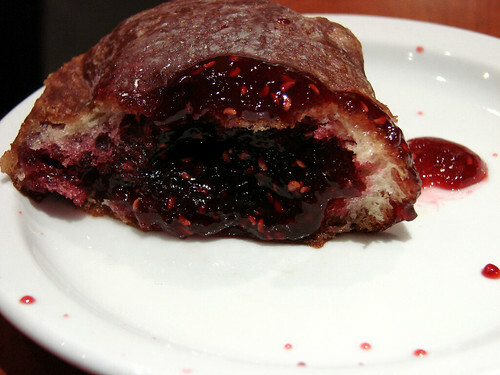 When we cut into it and discovered that it had much more raspberry filling than we expected. This was a mighty fine doughnut. And what's more, the filling was quite good. 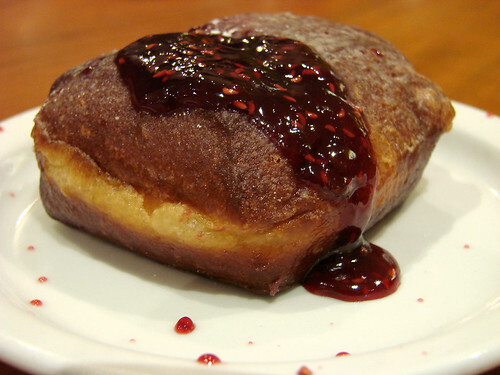 Most jam filled doughnuts are rather cloying, but that certainly wasn't the case here. Delicious. I wonder how it stacks up next to the Raspberry Jam Doughnut from Bouchon Bakery? The savory brioche was also quite tasty. 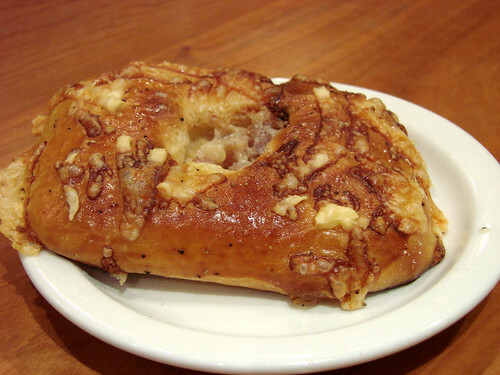 The brioche itself was light and sweet and the cheese and prosciutto made for a nice savory contrast. The slight warming was a good call with this one. For good measure--and because neither of us have had a cupcake in the New Year--Blondie and I added on a chocolate cream filled cupcake. The cake was very rich and chocolatey. 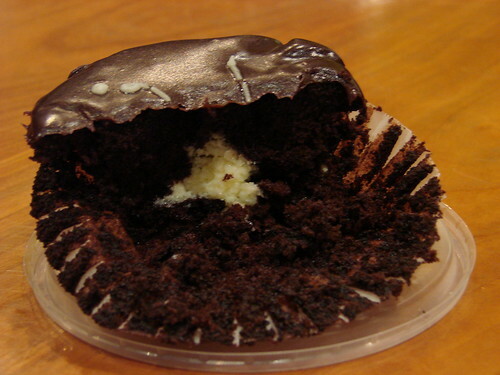 Oddly enough the bottom of the cupcake was more moist that the dense top of the cake. And though it only had a very thin schmear of frosting, the frosting that was there was decadent. The filling was a bit greasy and didn't add much to the experience. If the bomboloni are available, you can definitely give this one a pass. various locations throughout NYC including the concourse level of Rockefeller Center. Jealous of your bombolini! I had one this morning from Sullivan Street Bakery (ok, I had two - one cream, one jelly) and there was not nearly as much jelly in mine! 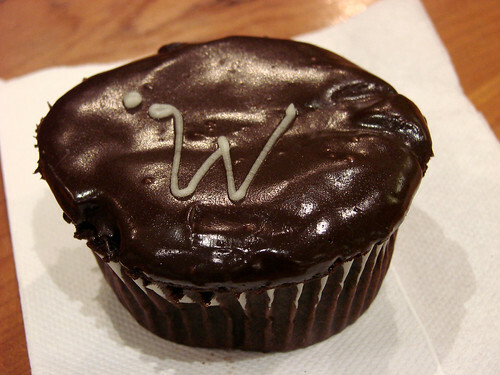 Just wanted to say that I dropped by the Bryant Park location of Wichcraft and they had no idea what I was talking about in regards to the Sullivan Street bakery products. So it seems that it's just selected locations, if not, only the Rockefeller Center one.